Alberta’s quick response approach—along with forest companies putting a priority on harvesting areas infected with the mountain pine beetle—is working to maintain a high level of control of the beetle in the province. It’s been seven years since the first major cloud of mountain pine beetles caught a stiff breeze somewhere in the infested lodgepole pine forests of central British Columbia and rode the winds through the mountain passes of the Rockies. They dropped like a locust infestation and black hail on vehicles and the healthy, green lodgepole pine forests surrounding Grande Prairie, Alberta. While the beetle continues to feast heartily on Alberta’s lodgepole pine forest, the infestation has so far been stopped in its tracks. In fact, it has diminished to single, occasional trees in the southwest corner of the province, where the beetle first showed up in the mid-1990s. Based on the size of B.C. 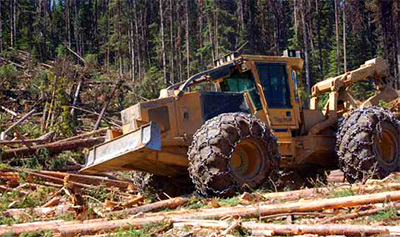 and Alberta’s pine forests, the best estimates indicate that 75 to 80 per cent of B.C.’s 14.5 million hectare lodgepole pine forest is beetle infested, while about 25 per cent or 1.5 million hectares of Alberta’s six million hectare lodgepole pine forest is currently infested. “That’s where all the action is now,” he says. “That’s where the province’s pine basket is and that’s where the in-flight clouds flew in back in 2006 and 2009.” This past winter was very mild, unfortunately, and the bugs had a really good over-winter survival, he added. Yet, surprisingly, the amount of heavy concentrations did not increase significantly over past years based on this past summer’s survey. Why the numbers haven’t increased remains a mystery. 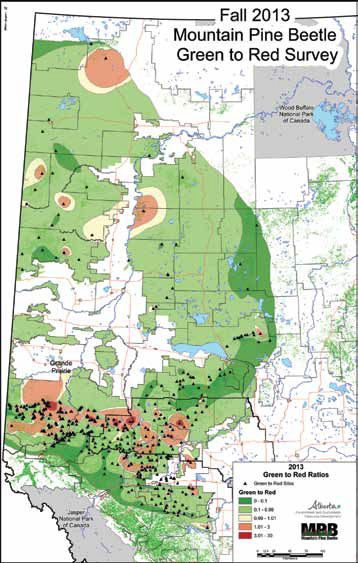 The 2013 survey map does show a significant infestation of beetles further north in the vicinity of Peace River and as far as High Level. This is the furthest north that beetles have ever been recorded and their existence in those areas is attributed primarily to the in-flights from B.C. MacDonnell says the province has not spent a lot of money for control in those areas as beetle control planners are confident that being on the edge of the pine forest, their numbers will diminish naturally, when the beetles eventually run out of a food resource. He says that the beetles will naturally travel only a short distance in search of a new food source, which shows just how unusual the beetle flight events from B.C. were in 2006 and 2009. Alberta’s quick response approach with dedicated crews as well as its total eradication or complete removal strategy—along with forest companies putting a priority on harvesting areas infected with the beetle—is working to maintain a high level of control. There has also been a positive change in how the battle is funded, as the Alberta government has now committed predictable funds for beetle control as a regular budget item each year. In previous years, funding was only allocated on an annual emergency basis, with those responsible for implementing the beetle control strategy not knowing from one year to the next whether funding would be renewed and at what level. Consequently, there was typically a mad scramble near the end of each fiscal year to accomplish as much of the critical ground control work as possible. Now, planners are assured of continuous funding, which will help to more effectively marshal forces on the ground over a longer time horizon for overall better response and control. This year, that amount has been set at about $44 million. Over $300 million has already been spent to fight the beetle infestation in Alberta, with the vast majority coming from the Alberta government, and some support from the federal government and Saskatchewan. British Columbia and Alberta are the primary habitat for lodgepole pine, together boasting over 20 million hectares of this highly valuable commercial softwood species. Lodgepole pine is the beetle’s preferred food source. 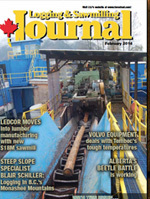 However, what’s troubling to the Canadian forest industry is that the beetle has reached the leading edge of the much larger jackpine forest, which extends from Alberta as far east as Newfoundland. To industry’s dismay, scientists have confirmed that the beetle can feed on this highly valuable commercial pine species as well. This explains why keeping the beetle at bay in Alberta and carefully monitoring its progress east is of concern to the federal government and the country’s entire forest industry. MacDonnell says that so far, monitoring crews have only identified occasional, single tree beetle infestations in the jackpine forest east of the leading edge of beetle infestation, near the town of Chisholm, about 200 kilometres northwest of Edmonton. The fact that the beetle has not migrated into pure jackpine stands over the past five years is good news for Canada’s forest industry. The general behavior of beetles has proven enigmatic as they have often survived at times when scientists were quite convinced their numbers would dwindle significantly, given winter weather patterns and that they have not always followed predictable paths as demonstrated by how they’ve currently halted their march east. Alberta has adopted a strategy like soldiers defending a wall as it relates to the beetle, realizing that the beetle still represents the number one threat in the province’s forests and will always be present to some degree given that lodgepole pine is its natural environment. While there are heavy pockets of beetle infestation in Alberta, it’s difficult to calculate how much of the lodgepole pine forest has some measure of infestation because of how the beetle population is dispersed. What’s clear from the fact that the beetle has not moved further east—and has essentially continued to flourish primarily in large pockets in west central Alberta—is that the province’s control methods are working, says MacDonnell. While beetle control planners are focused on Alberta’s hot spots, they are keeping a close eye on beetle numbers in British Columbia and the trend is definitely positive. According to the B.C. Ministry of Forests, Lands and Natural Resource Operations, the beetle infestation peaked in that province in terms of volume killed annually in 2005 and has slowed considerably since then. In terms of area, 4.6 million hectares of red-attack were surveyed in 2011. This is compared to 7.8 million hectares and 6.3 million hectares in the two preceding years. The amount of habitat available to the beetle has begun to diminish as the beetle has already attacked most of the mature lodgepole pine in the Central Plateau region of the province. Also, the rate of spread in other areas of the B.C. Interior has been somewhat slowed by more diverse terrain and forests with a greater diversity of timber species. “The number one plank in our strategy is to hold the ground here and stop the beetle from advancing, until such time as all the beetles are finished chewing their way through the forests in British Columbia, and we don’t have to worry about that source of other beetles that could come in and up the numbers in Alberta,” says MacDonnell.